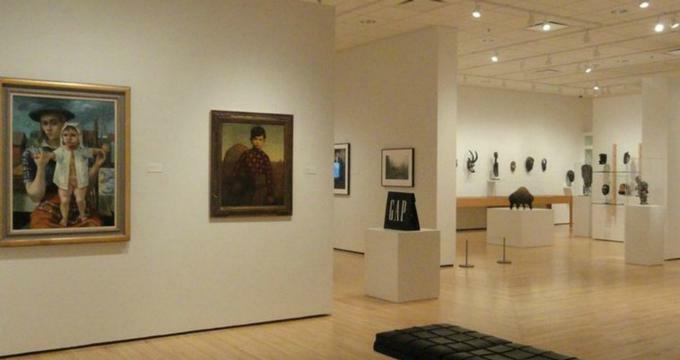 Located in Iowa City, Iowa, the University of Iowa Stanley Museum of Art holds one of the nation’s most renowned university fine arts collections, showcasing extensive permanent collections galleries and a variety of rotating temporary exhibitions. Though the University of Iowa Museum of Art was formally opened in 1969 after a large 20th-century works donation by Cedar Rapids’ Owen and Leone Elliott, the museum’s collections predate the construction of a permanent facility by several decades. Throughout the 1940s and 1950s, the university amassed a substantial collection of contemporary artwork, including notable works such as Jackson Pollock’s Mural, Max Beckmann’s Karneval, and Joan Miró’s A Drop of Dew Falling from the Wing of a Bird Awakens Rosalie Asleep in the Shade of a Cobweb. Following the Elliotts’ donation, which included large numbers of 20th-century prints, paintings, silver and jade works, more than 2,000 donors contributed to funding efforts for the creation of a new permanent facility to house the works. Soon after its opening, the UIMA earned a reputation as one of the nation’s leading university art museums for its expansive and significant collections holdings. In 1976, a 27,000-square-foot extension was added to the museum campus as part of major renovations, and three years later, an African art collection was added to the museum’s galleries as a result of donations by Muscatine residents Maxwell and Elizabeth Stanley. University offices for the University of Iowa Foundation and Alumni Association vacated the museum building in 1999, allowing for major renovations to convert the museum’s entire 70,000-square-foot premises into gallery and programming space. In 2004, the North Gallery for Special Exhibitions was opened to the public, adding another 6,000 square feet of exhibition space to the campus. Following a June 2008 flood, the museum’s collections were evacuated and relocated to storage in Chicago, with alternate gallery locations throughout the Iowa City region secured over the following year, including Davenport’s Figge Art Museum. On-campus exhibits were transferred to the Iowa Memorial Union in August of 2009, and in 2014, a partnership was established to redevelop the museum campus, with plans and a budget for the project approved in August of 2017. As of 2018, the University of Iowa Stanley Museum of Art’s collections are split between the on-campus UIMA@IMU facility, the university’s Black Box Theater, and the nearby Figge Art Museum while construction proceeds on a new permanent museum facility. The new museum facility, which will take architectural precautions to prevent flooding issues, will be part of an overall reimagining of the campus’ artistic facilities and will house classrooms and lab spaces for visual arts studies alongside public gallery spaces. In the interim, the museum remains committed to its mission to present significant fine arts exhibitions throughout the City and State of Iowa and offer educational and community programming for K-12 students, campus arts students, and the Iowa City community. The museum is an accredited American Alliance of Museums facility and admits its executive director as a member of the Association of Art Museum Directors. The museum’s permanent art collection holds more than 14,000 objects across artistic disciplines, including drawings, paintings, print work, sculpture pieces, photography, and fine ceramics and metals works. Collections span historic and contemporary works of the Americas, Europe, Asia, and Africa, with special collections for 20th century European and American works, indigenous art pieces of the Americas, and works created by Iowa artists. The museum is noted for its Stanley Collection of African Art, which holds more than 2,000 pieces, and its Western printmaking collection, which contains more than 5,300 historical prints. Notable artists on display include classic masters Pablo Picasso, Henri Matisse, Marc Chagall, Fernand Léger, and Vasily Kandinsky, as well as 20th-century contemporary artists Marcel Duchamp, Louise Nevelson, Beverly Pepper, and Mark di Suvero. Approximately 500 items from the museum’s permanent collection can be seen on display at UIMA@IMU, and a variety of temporary rotating exhibitions may be viewed at the Black Box Theater. A wide variety of educational programming is offered by the museum, including curriculum-incorporated field trip opportunities for elementary and secondary school students and collections tours for community groups. Tours may be booked at the UIMA@IMU facility, the Black Box Theater, or the Figge Art Museum collections in Davenport. Outreach programming is also available to bring fine arts education directly into the classroom in schools across Iowa, and a Senior Living Communities Program offers fine arts therapy and workshop programming for older Iowa City residents. Periodic public special events are also offered at the UIMA@IMU museum campus, including receptions for new exhibition openings, artists’ talks, and a public lecture series. For a complete listing of temporary gallery spaces on campus and around the state, visit the museum's website uima.uiowa.edu.